Just a little post to brag on our townhouse, which is gradually getting set up the way we want it. Of course, unpacking is a lot of work (on top of all our other work)—but that’s okay. 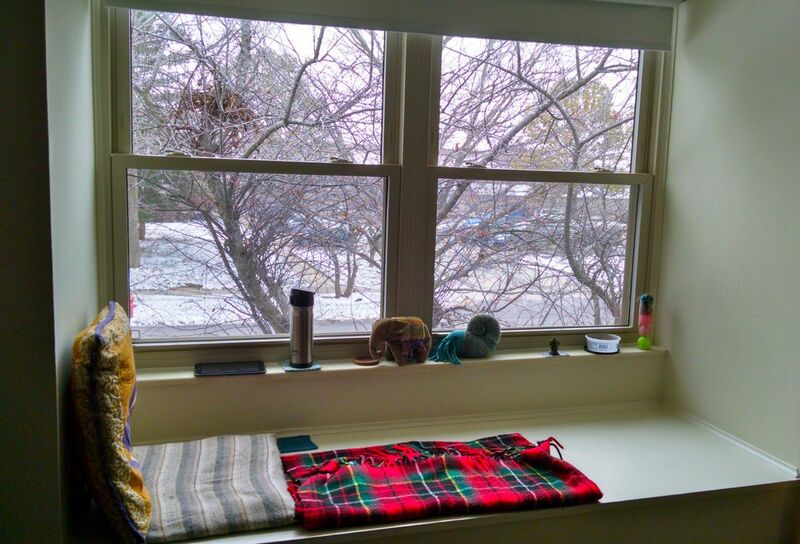 When we need a break, we can sit in the window seat upstairs in the study. I’m planning to get a wedgey cushion, but for now these two pillows are doing a fine job. Behind them on the window sill you can see: My tablet (which I’ll get back to reading a book on, as soon as I post this), my coffee flask, Wellington (one of my science fictional elephants, and sometimes the elephant of surprise), Norman the Chambered Nautilus, a tiny little Ganesh sculpture, a plastic yogurt container (currently empty, but used to hold odds and ends), and a tube full of brightly colored cat toys. And, of course, behind that you see the tree outside the window, and beyond that a view of Winfield Village looking east from our townhouse.